YEMEN, one of the poorest countries in the world,supposed to be a democracy, in the Southern Saudi Arabia peninsula and the Middle East, is on the gate from the Red See to the Indian Ocean and, therefore, strategically important. The Northern part of YemeN is mountainous. Today YemeN has a population of about 20 millions people (07/2007), stretches on 528,000 km and is a merging, in 1990, between Northern YemeN with a majority of Shiite population and South YemeN, the former British colony of Aden, with a large Sunnite majority. 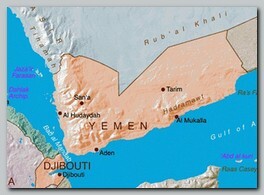 That merging caused tensions between North and South YemeN and a civil war in 1993. It also turned the Shiites in North YemeN to become the minority in their own country. There is, therefore, a constant conflict between the Shiites of the North, 43% from the general population, and the prominent Sunnite YemeNi regime. YemeN is a Muslim poor, undeveloped country with large areas, governed only by local tribes, similar to the tribe’s area in Pakistan or Afghanistan. The YemeNi remote tribes’ territory served always as safe haven for outlaws including, in the last decades, fugitives of Al Qaeda. From the remote, ungoverned and mountainous areas Al Qaeda operatives managed, from time to time, to carry out terror attacks on Western targets all over YemeN, mainly in the more accessible South.